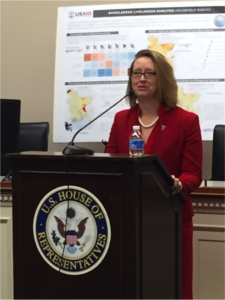 Dr. Patricia Solís speaks at the launch of a geospatial consortium in the Rayburn Building of the US House of Representatives to a mixed audience of data researchers and decision makers. The trajectory of data to decisions is not always straightforward. This article explores one dimension of why. A: Scientists regularly work with policymakers to try to better inform decisions, especially when it comes to the environment and natural resources. But there is a particular type of methodological problem that complicates this exchange. It matters because it is important to determine how data and scientific information influence or do not influence how decisions are made for the public. We term this problem the Decision-Accountability Spatial Incongruence Problem (DASIP) and show three case studies from very different disciplinary applications to illustrate it. In this article, we aim to identify and describe that problem so that we can find ways to overcome it. The problem is that we have found that the scientific answers to environmental problems often depend on the spatial scale of data used in the analysis. Spatial scale in this case refers to the extent or area, and also the size of that area. But there is often another, incongruent spatial scale over which decision makers have jurisdiction. Furthermore, the spatial scale at which decision makers are held accountable for those decisions is often yet another, incongruent scale or area. 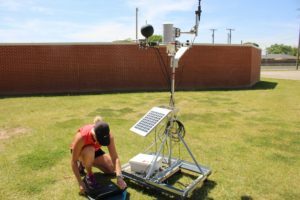 Dr. Jennifer Vanos collects in situ microclimate data in a schoolyard, which permits micro-scale temperature, radiation, wind, and humidity data to be applied in bioclimatic design and exposure studies. Her case study in the article illustrates how the scale and spatial unit of decisions may be incongruent with the fine-scale scientific data that is needed to inform those decisions. A: We make decisions routinely that are based on scales of data, both over time and space. The greater the incongruence in scale and related environmental/health/social/economic impact, the greater chance there is for an incorrect decision/policy to be made or an outcome that does not address the needs of the community most affected by the decision. We can use this approach to more accurately determine the strengths and weaknesses of democratic feedback loops for the purpose of measuring democratic “accountability” to better understand the policymaking process. Scientists who are in a position to inform policy can use this perspective to improve their studies in ways that better align with the realities faced by decision makers and improve the impact of their decisions over the areas most affected. Scientists can use these insights to help support efforts in study design that can lead to more spatially-relevant evidence-based policy making. The public can use this understanding to more accurately determine the effectiveness of their own interest group strategies on the decision-making behavior of voters and elected decision makers, and ideally find better ways to hold their decision makers accountable using facts. A: This work adds a layer of attention to making decisions and being held accountable for them to an important set of geographic work understanding the importance of looking at scale when analyzing how we complete and convey research and understand our world. 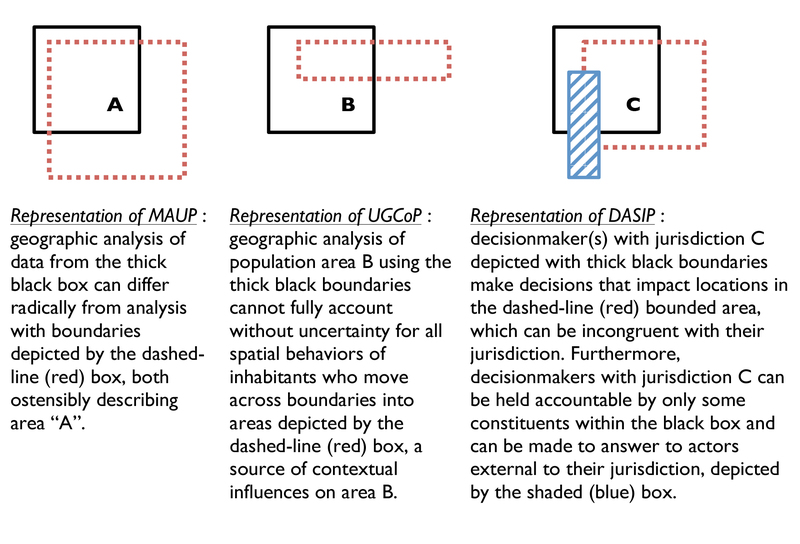 This includes such examples as gerrymandering (MAUP), and the complexity of understanding spatial behavior of individuals who move across arbitrary boundaries (UGCoP). A: To make environmental data relevant to health, well-being, etc. we need to examine it at the various scales that will influence the effect/impact.The concept of scale is critical to consider to support more policy makers and elected officials to make decisions based on facts and evidence. People who are in opposition to a particular decision also creatively use scale in their discourse and can do so quite effectively. Policy debates operate at multiple scales, and with differing, conflicting boundaries, but the decision where the policy is “won” or “lost” does have a particular scale (size, boundaries) related to the jurisdiction where it operates. The impacts of those decisions reach beyond those operational scales. Accountability for making environmental and natural resource decisions may also never come back as a feedback (either in space or time) to elected decision-makers. This incongruence is at the heart of methodological problems for improving scientific understanding of critical policy issues. A: Findings generated by DASIP-aware analysis encourages further development of a stronger lens from which broader national policy debate, public opinion, policymaking, and political accountability is clarified. Findings generated by DASIP-aware analysis strengthens the possibility for interdisciplinary science, particularly in the realm of environment and natural resources, to innovate and have a greater positive impact. A: As technologies and data advance/improve, we are able to make decisions at finer scales that can be more ‘correct’ in the sense of connecting impact to cause at similar or exact scales, rather than making large assumptions from sparse or mismatched scales, which may even result in incorrect decisions from such improperly scaled data. This brings to light how scale is be one of the fundamental concepts that interdisciplinary groups of scientists need to consider in the design of their research and applications.